MTV Presents: Fedde Le Grand Rocks Amsterdam, at Escape Venue on October 18th in the heart of the Dutch capital, will see the international house titan back on home ground, delivering fans who flock from the four corners of the planet a jaw-dropping showcase in immense beats and earth-shattering electro lines. DI-RECT will prove instantly recognizable to Fedde's home crowd, as will Fedde's wing man MC Gee who, alongside host Kubik LeFunk -- the voice of 'Rockin' N' Rollin' -- will be on hand to introduce the likes of F-Man, 'Lion' collaborator Michael Calfan who jets in from Paris for the occasion, rising stars and Fedde-favourites Roul and Doors and London's Tim Cullen (MOS) for a night that, with Fedde's track record and reputation, is guaranteed to supersede expectations. 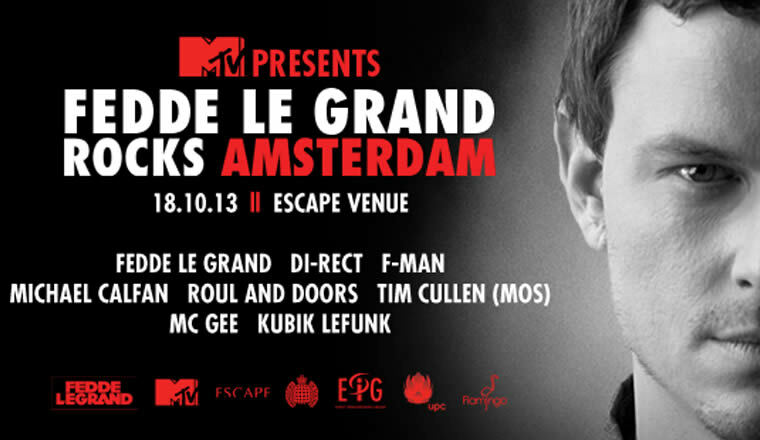 For those that can't make it to Amsterdam or indeed through the doors of Escape, fear not. Streaming live on both UPC and YouTube, the event will also be broadcast across a network of radio stations around the world, including Bulgaria, Cyprus, France, Brazil, Belgium, Greece, the Ukraine with more to be added over the remaining weeks.